This chest of drawers is constructed from Ash wood solids and veneers in a warm spice finish and features recessed panels, arrow cut feet, bronze knob hardware and a subtly moulded case top. 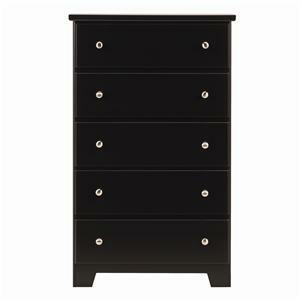 Offering six drawers total, the chest has two large, two medium and two small drawers to accommodate various items. The two small top drawers feature felt lining for safe storage of valuables. The Logan Six-Drawer Chest by New Classic at A1 Furniture & Mattress in the Madison, WI area. Product availability may vary. Contact us for the most current availability on this product. The Logan master and youth bedroom collection boasts a warm spice finished veneer and an eclectic blend of Mission and contemporary design styles. Select from a variety of storage cases and bed styles, with beds available in twin, full, queen, king and California king sizes for the bedroom set that is right for you. Collection features include open slats and slatted panel accents, bronze metal hardware, recessed paneling and felt lined top drawers. The Logan collection is a great option if you are looking for Casual furniture in the Madison, WI area. Browse other items in the Logan collection from A1 Furniture & Mattress in the Madison, WI area.